Identify the plant growth stage. If it’s difficult to determine, use planting date and growing degree days as a guide. 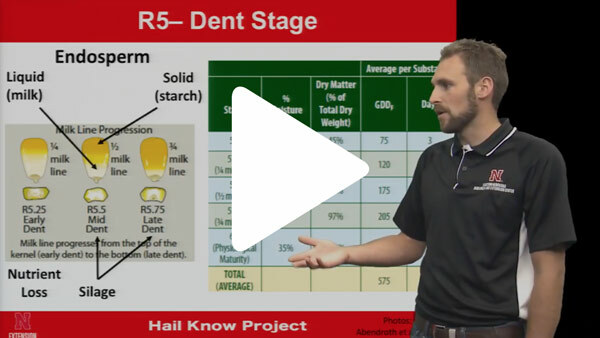 A number of factors should be considered when evaluating early season crop damage. Evaluating and recording crop progress each week will be helpful in determining the extent of crop damage. Use this time to evaluate production practices used and plan for next year’s crop. If your field was on the receiving end of a hail-producing storm, you may have a lot of questions. What should I do first? When should I scout my fields for damage? Who should I contact and when? Find out the answer to these questions and more in this infographic. 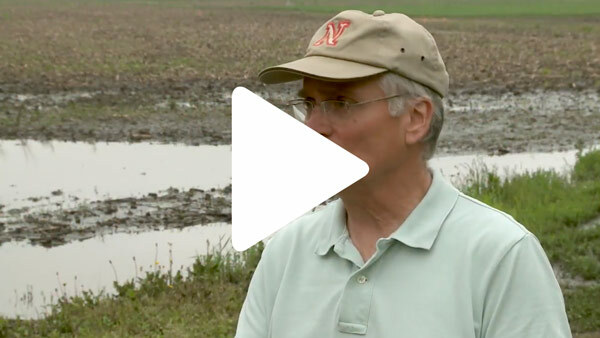 Be confident in accurately assessing hail damage to crops and the potential for regrowth and recovery or the need to replant with research-based information from Nebraska Extension. 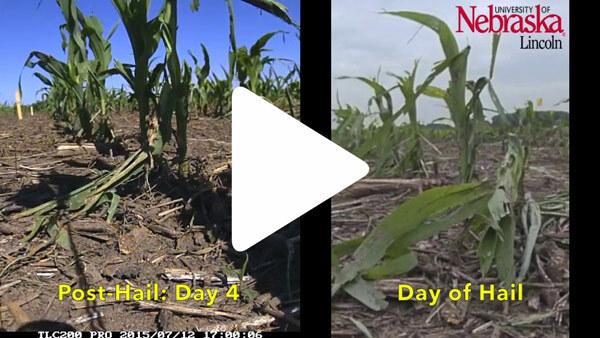 As part of a 2015 University of Nebraska-Lincoln research project on the effects of hail on crop development, Justin McMechan used time lapse photography to show how V4 corn recovered during the seven days post hail. McMechan and Roger Elmore, Extension Cropping Systems Specialist, used a hail machine. 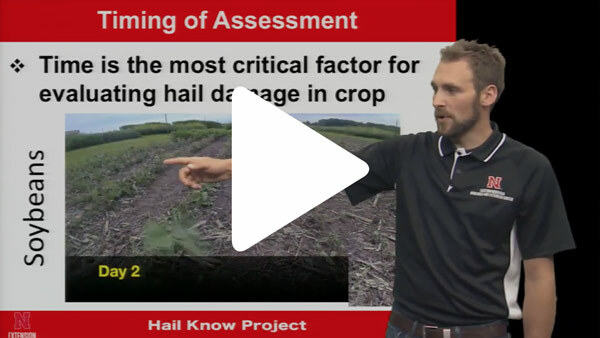 Production loss estimates in corn from hail damage is a critical first step for determining the need to replant or to make adjustments on future inputs. Regardless of crop development stage, it is critical to wait 7-10 days to allow the crop to respond for proper evaluation. Production loss estimates by the Federal Crop Insurance Corporation in corn may include remaining plant stand, defoliation and direct losses from ear damage depending on the stage of development. Additional losses and quality issues can occur with fungal infections so continued scouting of hail damage fields is important. 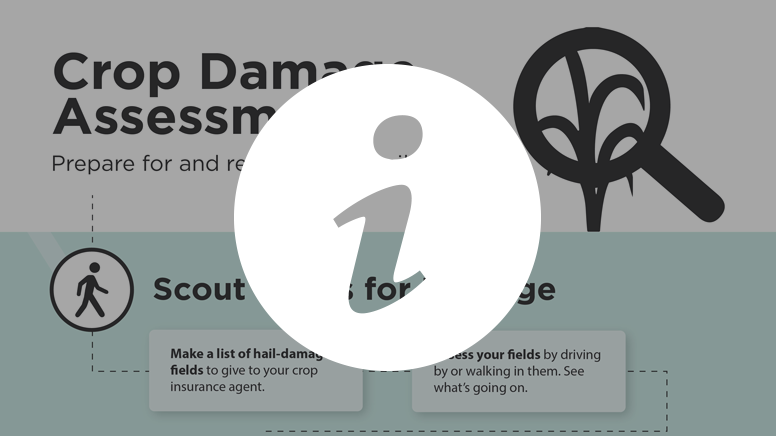 Be sure to contact your crop adjuster before making any management decisions on a hail damaged crop. Justin McMechan, University of Nebraska Crop Protection and Cropping System Specialist.